Twigg Shoe Services are based in the heart of historic Carlisle. The only high street shop in Cumbria, providing a fully bespoke service for Gentleman's footwear. The shoes you want are the shoes they make! Also they can rescue those old favourites that you can't bear to throw away, with their high class shoe repair service. 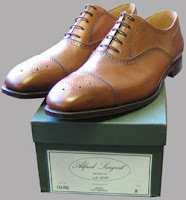 They are also Carlisle's only stockist of Alfred Sargent Goodyear welted formal and country shoes. Determined to make quality a priority in every aspect of shoe making and shoe repairs, and to ensure that customers are happy to return again and again. Andrew Twigg the man doing the making and the repairing will also be the man doing the meeting and greeting, this helps build up customer confidence knowing that there will be a continuity in the work undertaken. As a relatively new business established in July 2006 in Carlisle, He's already getting regular customers. Plus, first time customers saying "how nice to have a real cobblers shop back in Carlisle." 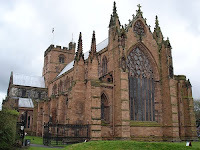 The workshop is situated on on a cobblestone street located between Carlisle Cathedral and Carlisle Castle, close to City centre and just a 10 minute walk from us here at Steed. I bought a couple pairs of Alfred Sargent's from him which were very well priced and I'm hoping to commission a bespoke pair later on in the year. All this reminds me of the bootmaker who was given the Royal Warrant. When Her Majesty's Inspectors came to visit to see that everything was in order, they were horrified to find the new sign the proprietor had erected, which read "Cobbler's To The Queen"